Andray Abrahamian has published a report with the US-Korea Institute on developments in the Tumen Triangle. The Tumen Triangle region-where North Korea, China and Russia meet-is, in many ways, the story of regional integration being held back by the political concerns of Pyongyang, Beijing and Moscow. There are long-term forces at work here, such as Moscow’s concerns over Chinese dominance in the sparsely populated Russian Far East. This legacy of mistrust frames cross-border interactions and despite recent warm relations, major cross-border cooperation remains limited. In this USKI Special Report, Andray Abrahamian, Director of Research at Choson Exchange examines historical legacies, contemporary relations and shifting strategic priorities between the three countries. The report then focuses trade and investment in the Tumen Triangle region, particularly how the Yanbian Korean Autonomous Prefecture and Primorsky Krai interact with and affect Rason Special City, the center of the Rason Special Economic Zone. You can download the report here (PDF). In Hanchon, a district in Pyongwon county of South Pyongan province, the small wind energy project team visited the houses of two farmers Mr. Ri Chum Uk and Mr. Kin Yong Ki, who have had wind turbines installed inside their homes. These are small wind turbines, 5 metres high with 300 Watts of installed capacity charging individual 12 volts batteries. With it the farmer says he can operate such electric items as 2 bulbs, a TV, a DVD or a karaoke system with amplifier. When asked, the two farmers each explained that they had paid $150 for the wind turbine, and spent $5.00 on annual maintenance cost. This info was not independently verified.To charge a full battery takes between 4 to 6 hours and can last about 7 days, depending upon the wind speed and the state of the battery. In the village, it seems that one or two neighbours can each bring their battery to get it charged at Mr. Ri or Mr. Kim’s house. When asked “what did they like the best with this admittedly small improvement“, both replied; “to have electricity when I want it”. In this county alone, according to the local county manager, 100 turbines were installed in people’s households and in farm offices, made in the Daily Necessities Factory in the adjacent county of Sukchon. Mr. Kim Ryong Kuk, the manager of the Factory explained that almost once every quarter, he or his colleagues were observing almost 60 turbines in order to get feedback from clients. All users receive training during installation by the manufacturer. Batteries are made locally or in China. The role of UNDP’s small wind energy project is to promote and diffuse this green technology by improving quality standards and guidelines and demonstrating best practices for households along with social buildings to directly improve people’s energy status in concrete ways. These types of projects aim to provide support to rural populations in concrete ways. I have no doubt that there will be many obstacles along the way but I feel that we can overcome them in time and in the process improve peoples’ lives.On another day, we went to Pyongsong city to see a larger Mast (10 Kilo Watts) and a solar panel in full use at the County Hospital. We could see how the staffs were strategic in their use of the renewable energy to conduct operations and obstetric aid in emergency cases during electricity cuts; the wind turbine is backing up the work of two operation rooms and two emergency rooms. When looking through the door of one emergency room, the surgeon, operating on a young boy’s leg, saw me and pointed at the light overhead appreciatively. The whole package of a 5 kW wind turbine and a solar panel is $30,000. These types of projects aim to provide support to rural populations in concrete ways. I have no doubt that there will be many obstacles along the way but I feel that we can overcome them in time and in the process improve peoples’ lives. The U.N. patent agency says it has been cleared of breaking sanctions against North Korea by sending computers to the regime in Pyongyang. The Geneva-based World Intellectual Property Organization said Monday that a U.N. panel found it had not violated any of three U.N. Security Council resolutions by providing technical assistance to North Korea. In July, the Foreign Affairs Committee in the U.S. House of Representatives launched an investigation into whether WIPO had violated U.N. sanctions by sending computers and other technology to Iran and North Korea. WIPO has insisted it did nothing wrong in providing ‘‘standard IT equipment’’ to the patent and trademark offices in those two countries. The Iran review is still pending. QUESTION: Two small things. One on WIPO, if that’s how it’s pronounced. WIPO. So following suggestions that WIPO allowed the transfer of banned technology to Iran and North Korea, has the United States been able to mount its own investigation of this? MS. NULAND: Well, first and foremost, to repeat what we said here last week, we share the concerns raised here in Washington, in the media, regarding these equipment and software transfers by WIPO. We’ve been concerned since we first learned that they had transferred equipment to both North Korea and Iran. We’ve been in contact with WIPO and urged them to institute substantive safeguards. Our own preliminary assessment, but we are still seeking more information from WIPO, is that there doesn’t appear to have been a violation of UN sanctions. However, this has now been referred to the sanctions committee for them to make their own determination, so we will await the views of the respective UN sanctions committees. We are also seeking more information from WIPO so that we can conclude our own work on whether there was any violation of U.S. law, but we don’t yet have everything that we need in order to make that assessment. QUESTION: I understand that you don’t yet have everything you need to make a final assessment. But based on what you have, are you able to make a preliminary assessment as to whether or not any U.S. laws were broken? MS. NULAND: I don’t have a preliminary assessment for you. We’re still seeking some more detail from WIPO. QUESTION: And then one last thing. I believe there was supposed to have been a hearing in the House today on this that got canceled, I think because the WIPO officials were not going to be available to testify. Are you – given that you don’t yet have all the information that you want, are you satisfied that you are getting enough cooperation from them? MS. NULAND: Well, we are continuing to work with them, and that is a conversation that is ongoing. I think we are – we have seen a number of positive steps from WIPO with regard to their procedures going forward that are important. For example, they have agreed to a commission that will have an external and independent auditing ability with regard to their projects to try to prevent this kind of thing from happening in the future. As I said, they’re going to seek a retroactive opinion from the sanctions committee, which wasn’t evident at the beginning of this. And they’re also going to ensure that any future projects are reviewed by their legal counsel. But we are still working with them on some of this U.S. stuff that we need. QUESTION: But you don’t feel like they’re stonewalling you on this? MS. NULAND: We do not. No. On Tuesday, the ranking Republican and Democrats on the U.S. House Foreign Affairs Committee accused Gurry of preventing two senior WIPO staff members from testifying before a planned committee hearing, forcing its cancellation. The staff members asked to testify were James Pooley and Miranda Brown, a source familiar with the matter said. “Director-General Gurry is obstructing this committee’s investigation of WIPO’s transfer of U.S.-origin technology to rogue regimes under international sanctions â€” a transfer that occurred on his watch,” Republican chairwoman Ileana Ros-Lehtinen and ranking Democrat Howard Berman said in a statement. A WIPO spokeswoman was not immediately available to comment on the statement. Gurry told Reuters late last week that he would allow “a properly competent person” to testify. Lawmakers have suggested that the United States freeze contributions to WIPO until they are satisfied it is cooperating, although this would likely have a limited impact on the U.N. agency, which relies on member state contributions for only 10 percent of its budget. Following some recent media attention and requests for information from certain member states relating to WIPO’s technical assistance programs, WIPO Director General Francis Gurry provided the following information and clarifications concerning the actions that have been undertaken, or are being undertaken, by the Organization in relation to the provision of technical assistance to countries that are the subject of United Nations (UN) sanctions. The Director General reiterated that the Secretariat is treating concerns relating to the Organization’s technical assistance programs to countries that are the subject of UN sanctions with the utmost seriousness. 1. Following the expression of initial concerns over the provision of standard IT equipment to patent and trademark offices for the processing of intellectual property (IP) applications, new internal procedures were established and made operational on May 1, 2012. Under these procedures, all managers must refer any activity proposed in a country subject to UN sanctions to WIPO’s Legal Counsel for guidance and clearance. The Legal Counsel will, wherever necessary, consult the appropriate UN Sanctions Committee. Additionally, any work plan for a country subject to UN sanctions will be submitted at the commencement of each calendar year for guidance by the appropriate Sanctions Committee. 2. The provision of standard IT equipment to the IP offices of the Democratic People’s Republic of Korea (DPRK) and the Islamic Republic of Iran that occurred in the preceding years, within the context of the Organization’s business modernization program for IP Offices in developing countries, is being referred to the relevant UN Sanctions Committees for their information and guidance. 3. The initial steps are being undertaken for a full external and independent review of the technical assistance provided to countries subject to UN sanctions. 4. A new internal instruction has been issued ending any provision of IT hardware in any of WIPO’s technical assistance programs. The Director General reiterates his commitment to transparency and re-affirms the readiness of the Secretariat to continue to provide any information requested by any of the member states of the Organization. While the legal advice received with respect to the technical assistance provided to DPRK and Iran was that the technical assistance was not in breach of UN Sanctions, it is hoped that the measures outlined above will provide assurance that the Organization is treating this matter with the seriousness that it warrants. South Korean firms and China’s Jilin Province agreed to engage in joint venture projects worth 3.9 trillion won (US$3.4 billion), a local business organization said Monday. Under the memorandum of understanding reached in Seoul, 48 South Korean companies and 48 Chinese regional government agencies and businesses will form partnerships to move forward on various business projects, the Korea Chamber of Commerce and Industry (KCCI) said. The two sides will engage in such areas as agriculture, construction, energy, distribution and tourism, South Korea’s largest private economic organization said. Lotte Group, the Korea Software Enterprise Association and HS Machinery Co. have expressed interest in business tie-ups with Jilin, which is located in northwestern China and includes Yanbian Korean Autonomous Prefecture. The province also borders North Korea to the south. The KCCI said Jilin is one of China’ main heavy industrial hubs with average annual growth in the past three years reaching 13 percent. Such growth promises considerable business opportunities for South Korean companies wanting to diversify into emerging markets. The Chinese government announced Wednesday that it has approved the establishment of an international cooperative demonstration zone in Northeast China’s Jilin province to boost cross-border cooperation in the region. In a document posted on the central government’s official website, the State Council said the zone is expected to expand investment cooperation in northeast Asian regions. Located in the port city of Hunchun, the demonstration zone will cover 90 square km and include an international industrial cooperation zone, a border trade cooperation zone and economic cooperation zones — one between China and the Democratic People’s Republic of Korea (DPRK) and another between China and Russia, it said. The demonstration zone will focus on the development of local manufacturing and processing industries, including those for auto parts, agricultural and animal products, seafood, new materials, medicines, textiles and garments, the document said. The Tumen River in Hunchun straddles the borders of China, Russia and the DPRK. In 1992, China, Russia, the DPRK, the Republic of Korea (ROK) and Mongolia launched a joint development project in the Tumen River area, a move made to strengthen regional cooperation in the area. The State Council has called for more efforts to boost the construction of Sino-DPRK and Sino-Russia international transit corridors and promote cross-border economic cooperation between China and the two countries. More supporting policies, including fiscal and taxation support, will be implemented to encourage the development of new energy, new material equipment manufacturing and other projects in the demonstration zone, according to the State Council. The construction of the demonstration zone will also make border regions more open to the outside and strengthen the social and economic development of local areas, the document said. The authorities in China’s Jilin Province are investing billions of Yuan in multiple projects along the Sino-North Korean border. The construction is concentrated in areas adjacent to major North Korean border towns in the mountainous region, giving it the hypothetical potential to provide massive opportunities for future Sino-North Korean economic growth. According to Jilin Shinmun and other local media outlets, the high-speed train, which will allow travel from Hunchun to Changchun in two hours at speeds of up to 250kph, is under construction at a predicted cost of 37.7 billion Yuan. Jilin Province is also planning a “five border region highway” in its 12th Five-Year Plan from 2011 to 2015. The Changchun to Hunchun leg is already open, while legs from Changchun to Huyinan, Songjangheo to Changbai, Changchun to Mt. Baekdu to Yanji, Changchun to Linjiang and Changchun to Jibian are under construction with the typical degree of Chinese speed. Among these locations, Changbai, Linjiang and Jibian all face major North Korean towns (Hyesan (Yangkang Province), Chungkang (Jagang Province) and Manpo (Jagang Province). The province is also putting weight behind railway construction travelling towards North Korea; from Nanpin to nearby Musan (in North Hamkyung Province), Kayisan to Sambong (in North Hamkyung Province) and Changbai to Hyesan. When all the construction is complete, there will be a bridgehead connecting the Tumen to the Yalu and linking all North Korea’s major cities with the Chinese economic miracle. If trade and cooperation between the two countries grows more active than it is now, the newly built highways and railways will form the core pathway for commercial distribution. However, there are also major concerns with the plan. First and foremost, defection will become more difficult when the new developments are complete. The regions where highways and railways are now appearing have long been major defection routes or hiding places for new defectors. In particular, a warning device installed by Jilin police in border villages, while an improvement in terms of public security, can also be used to report North Korean defectors to the authorities. The device, known as the ‘BF-01’, has been installed in 6,000 homes along the border at a cost of 5 million Yuan, connecting them with public security offices in an emergency. When pressed, names, addresses and the sound from the scene is transmitted to the local police station, border guards and neighbors. 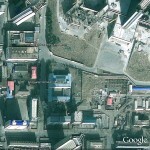 I have been writing about North Korea’s IT industry since the start of this year. 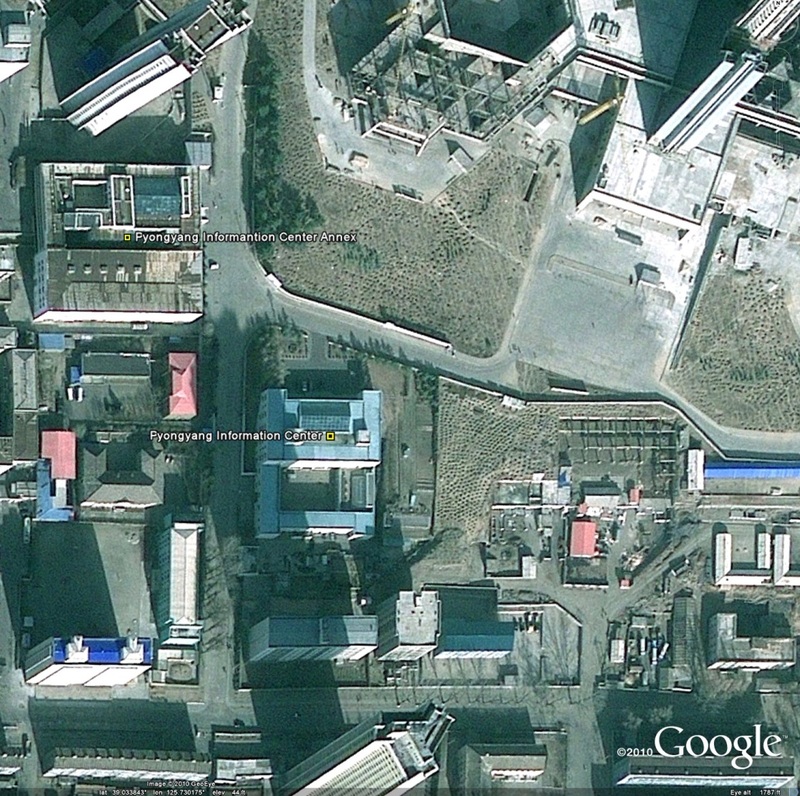 In this installment, I would like to introduce North Korea’s major information and communications institution. If the Choson Computer Centre (KCC) is called the centerpiece of North Korea’s IT R&D, Pyongyang Information Centre (PIC) is the mecca of their software development. The PIC, founded on July 15, 1986, was jointly funded by the United Nations Development Programme (UNDP) and Jochongnyeon (the pro-Pyongyang federation of Korean residents in Japan). It is situated in Kyong-Heung dong near the Botong River in Pyongyang. The PIC was created as the Pyongyang Program Development Company and changed its name to Pyongyang Electronic Calculator Operator in October of 1988 and then again to Pyongyang Information Centre (PIC) in July of 1991. 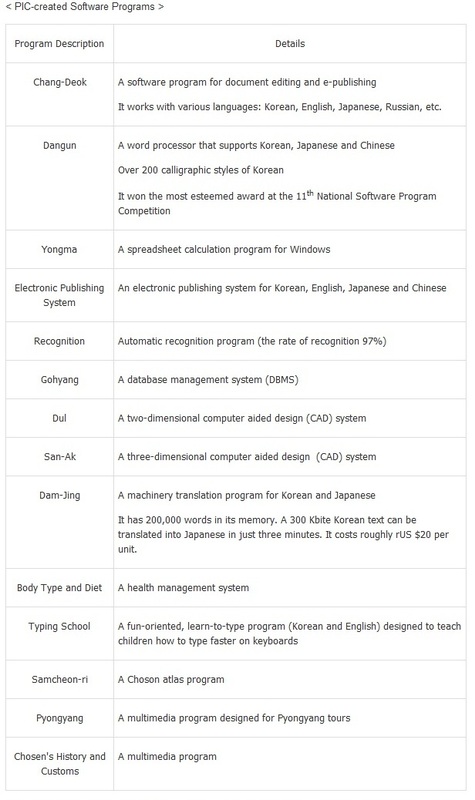 As of now, the best and the brightest of North Korea’s IT talent is developing various kinds of programs and devices at the PIC: nearly 300 IT professionals, who graduated from the North’s most prestigious universities such as Kim Il-sung University, Kim Chaek University of Technology and Pyongyang University of Science and Technology (PUST), are on the payroll of the PIC. On the overseas front, the PIC has its branches in China, Japan and Singapore, where PIC IT experts are working on software development, and has teamed up with foreign companies to jointly develop software programs and expedite technology transfers. The PIC, North Korea’s major software developer, has been at the vanguard of these following areas: language information processing, machinery translation, document editing, global IMEs (Input Message Editor), computer-aided design (CAD), networks, database systems, fonts, multimedia, dynamic images, etc. For instance, the PIC’s database development taskforce consists of about 40 IT experts, who are all working on the development of information management systems for production lines, companies and other institutions. The PIC’s publishing group has been engaged in various R&D projects from the development of Chang-Deok, a PC word processor, to DTP (desk top publishing) systems for Mac computers. Last but not least, the PIC’s application software group is keen on CAD, virtual reality and the development of project management devices. The PIC has been developing a plethora of software products: embedded software, CAD, image processing, Korean-language information processing and systems, network management systems, multimedia dynamic images, etc. The PIC’s 3D CAD has been widely employed by North Korean and foreign architectural design companies and more sophisticated versions of it are coming out. What’s more, the PIC is ramping up its joint R&D efforts with overseas IT developers with a focus on the development of diverse image processing programs. Korean-language information processing and systems are about developing the technologies for character recognition, voice recognition, natural language processing and primary retrieval while the development of network management systems includes fire walls, security solutions, encryption, e-commerce, IC cards, instant messenger programs, mobile game programs, etc. They are also working on the development of multimedia and dynamic images: technologies for producing 3D materials, 2D cartoon production and the technology for adding accompaniments to images are being developed. The PIC’s font development team has developed 300 Korean fonts and a myriad of calligraphic styles for imported mobile phones and dot fonts for PDAs. The PIC has thus far scaled up its IT exchanges with overseas information and technology companies as well as R&D institutions. A case in point is the North-South joint venture, HANA Program Center, which is located in Dandong-si in Liaoning, China and was jointly invested in May of 2001 by the PIC and North-South HANA Biz, a subsidiary of South Korea’s Dasan Network. Another showpiece of the PIC’s effort for joint R&D is the software development for fonts and Chinese character recognition in collaboration with Soltworks (an e-publishing software developer). On top of that, the PIC’s IT exchanges with overseas institutions have been on the rise. As such, inter-Korean cooperation projects will serve as the driving force behind the PIC’s IT exchanges with South Korea. To that end, non-military sanctions imposed on Pyongyang should be eased, such as the Wassenaar Arrangement (a multilateral export control regime (MECR) with 40 participating states) should be eased to move US – North Korea relations forward and the US’s EAR (Export Administration Regulation) on the North should be scaled back. Above all, IT-initiated unification of the two Koreas should be preceded by pragmatic dialogues with the North and North Korea’s efforts for reaching out to other nations. As of now, the North needs to draw up a future blueprint to embark on phased cooperation with the S. Korean government and companies in a bid to open its doors to the international community. [T]hey are an interesting institution that not everyone has a chance to see from the inside. What was interesting is that they really work on software for foreign markets (i.e. mobile software for well known international cell network providers). In addition to that they have an impressive library of books on all topics of software development which was up-to-date at the time I visited. In contrast to the other institutions they immediately showed commercial accomplishments instead of where the leaders have walked. Employees have access to a gym too. A place out of place in Pyongyang. What I found interesting in the article is that the mentioned developments match some of those the KCC presents in their building. The PIC made much more an impression of a service unit for foreign customers than for the country itself. However, they are training hardware specialists for the infrastructure there. North Korea and China are already starting economic cooperation projects in the border area across China’s northeast and the North’s Rajin-Sonbong region. The Chinese Ministry of Transport recently designated Jilin Province as a pilot region for international trade and logistics encompassing the three northeastern provinces of China and the Duman (or Tumen) River area, the China Shipping Gazette reported last Friday. The decision is aimed at facilitating transport of goods from China’s northeast to Shanghai and the south via customs points in the Chinese city of Hunchun and the North’s Rajin-Sonbong Port, the weekly added. A representative of the Yanbian Korean Autonomous Prefecture in Jilin also signed an agreement on bilateral economic cooperation with Kim Su-yol, the chairman of the Rajin-Sonbong special city people’s committee, at the sixth Northeast Asia Trade Expo in Changchun last Thursday. That’s a headline we never expected to write—especially in the context of the United Nations Development Program’s scandal-ridden operations in North Korea. In 2007, the U.S. mission to the U.N. shined a light on the U.N. agency’s record of gross mismanagement while operating in that rogue dictatorship, including large sums of money that vanished after being transferred to Pyongyang and dual-use technology shipped to the North without U.S. export licenses. These abuses came to light thanks in part to a whistleblower by the name of Artjon Shkurtaj, an Albanian-born accountant who served as chief of operations for all U.N. operations in North Korea in the mid-2000s. Mr. Shkurtaj was outraged at the violations he saw and after two years of trying to get his superiors at UNDP headquarters in New York to take corrective action, he took his information to the U.S. mission to the U.N. The UNDP responded by firing him and taking every opportunity to malign his integrity. When Mr. Shkurtaj complained, a UNDP-sponsored investigation found that his firing had not been in retaliation for blowing the whistle. What a surprise. The U.N. bureaucracy and its diplomatic coterie also circled the wagons and attacked the U.S. mission for daring to raise the subject. Now, more than three years later, Mr. Shkurtaj has been substantially vindicated. On Tuesday the U.N. Dispute Tribunal ordered the UNDP to pay its former employee $166,000 in compensation for its failure to give Mr. Shkurtaj the opportunity to respond to its adverse findings against him. Judge Memooda Ebrahim-Carstens ruled that the UNDP violated Mr. Shkurtaj’s “due process rights, damaged his career prospects and professional reputation, and caused him emotional distress.” She let stand the UNDP’s finding that the firing had not been retaliatory. Beyond Mr. Shkurtaj’s case, the judge’s 24-page opinion is worth reading for its inside look at the imperious manner in which the U.N. bureaucracy operates. The infighting and buck-passing are world-class—even in the office of Secretary-General Ban Ki-moon, who presents himself as a reformer. The ruling in Mr. Shkurtaj’s case suggests that the Dispute Tribunal, established a little over a year ago, is serious about its mandate to be “independent, professionalized, expedient, transparent and decentralized.” The panel has already clashed with Mr. Ban’s office over other rulings. The finding also vindicates Mark Wallace, the U.S. official who led the charge for transparency at UNDP despite hostility from the media and from Michigan Democrat Carl Levin, and with very little support at the State Department. At yesterday’s daily press briefing, a spokesperson said that the U.N. is “studying” the panel’s latest decision. It’s possible the Secretary-General will decide to appeal. If Mr. Ban were truly serious about cleaning up his own house, he would write Mr. Shkurtaj a letter of apology, thank him for having the courage to alert the U.N. to instances of wrong-doing, and give him his job back. Past posts which reference the UNDP can be found here. As the xenophobic North Korean regime of Kim Jong Il appears to be inching toward a murky transition of power, the United Nations is laying plans to spend more than $290 million on a welter of programs in the communist state—including a scheme to produce an algae sold in the U.S. as tropical fish food–provided someone else comes up with much of the money. The money is by no means a sure thing, especially if the unpredictable North Korean dictator rejects any of the stringent oversight conditions attached to money from some of the important donors the U.N. hopes will chip in. The U.N. plans, however, demonstrate the determination of the world organization and its most influential backers—notably, the U.S. government, which is the biggest single financial supporter of most U.N. aid and development organizations– to keep dangling carrots of assistance before the North Korean regime, even at its most provocative. The U.N. plans persist despite such incidents as the March 26 sinking of a South Korean warship, the Cheonan, most likely by a North Korean submarine, and the regime’s continued nuclear saber-rattling, especially toward South Korea. Just last month, for example, North Korea threatened a “powerful nuclear deterrence” in response to a joint U.S.-South Korean antisubmarine exercise prompted by the Cheonan incident. All those uncertainties fade, however, alongside a bigger one: rumors that the ailing and reclusive Kim, who returned on Sunday from his second trip to China in three months, hopes to install his youngest son, Kim Jong-Un, as his successor– a process that could already be well under way. Whatever the outcome of the succession process, at least a dozen U.N. agencies and offices clearly hope to be deeply involved over the next five years in North Korea’s national welfare, in areas ranging from health care and education to sanitation and civil service training, “strengthening knowledge networks” in agriculture, alternate energy development, and transportation, not to mention improving North Korean export trade. A significant number of the efforts will also go to bolstering the capabilities of the North Korean government, which is not surprising, since they are prepared in close collaboration with various departments of the ruling apparatus. These efforts include a strong focus on health care delivery and education (already problematic in a totalitarian state burdened with a smothering cult of the personality). But they also include more ambiguous activities in a brutal and thorough-going dictatorship such as North Korea. Among them: coordinating “national knowledge networks and practices,” “management and specialist training,” and—in a country that regularly threatens its neighbors with nuclear and conventional war—a “disaster preparedness and response strategy” spurred by North Korea’s famines and floods. All of these activities are depicted by the U.N. documents as being strictly humanitarian in nature. The array of plans is laid out in schematic form in a 22-page “United Nations Strategic Framework Results Matrix” for North Korea, which is being presented to members of the supervisory Executive Board of the United Nations Development Program (UNDP), the U.N.’s principal development coordinating agency, at a meeting in New York this week. Click here for the matrix. The framework is buttressed by UNDP’s own country program for North Korea, which is a $38.3 million portion of the larger total. Both documents cover the period from 2011 to 2015. Click here for the UNDP Country Program. The UNDP contribution is noteworthy, among other things, for the fact that most of the money–$34 million—can be counted on to exist. That amount is described in the annex to the country program as coming from “regular” UNDP resources, meaning its core budget. Only $4 million of UNDP’s spending in North Korea comes from other contributions. A UNDP spokesman underlined—as does the country program—the extent to which UNDP claims to be adhering to newly strengthened safeguards in relation to its North Korean program. UNDP activities in North Korea exploded into scandal in 2007, leading to suspension of its program until 2009. Among other things, an independent investigative panel subsequently determined that UNDP had wrongfully provided millions in hard currency to the North Korean regime, ignored U.N. Security Council sanctions in passing on dual-use equipment that could conceivably be used in the country’s nuclear program, and allowed North Korean government employees to fill key positions. In the current program, UNDP emphasizes that it has revamped its hiring and currency policies, but adds that “a proper monitoring and evaluation plan is necessary to ensure accountability and transparency in project implementation.” The careful wording indicates that at least some of that planning remains to be done. While UNDP has actual cash to spend, however, nearly $119 million of some $128 million that UNICEF plans to spend in North Korea over the next four years—about 93 per cent—is expected to come from outside donors, according to UNICEF’s own country plan for North Korea. That is, as UNICEF delicately puts it, “subject to the availability of specific purpose contributions” from those willing to put up the money. Click here for the UNICEF Country Program. Much of that volunteer UNICEF money would go toward building up North Korea’s grievously neglected clinical health care facilities, bolstering maternal and early childhood care, early childhood education and large-scale vaccination and medication campaigns to fight AIDs, malaria and tuberculosis. Most of the anti-disease money is supposed to come from the Global Fund to Fight AIDS, Tuberculosis and Malaria (GFATM), a Geneva-based institution financed in part of Microsoft Found Bill Gates and his wife, Melinda. Nowadays, the U.S. government contributes 28 percent of the GFATM’s funds. And so far, GFATM has only handed over $12.45 million to UNICEF, according to the U.N. agency’s spokesman, Chris de Bono, for its anti-malarial and TV campaign. (According to GFATM’s website, UNICEF has received $18.35 million, out of about $31.5 million approved so far.) According to de Bono, another $56 million is due to come from GFATM starting in 2013, provided a “number of conditions” laid down by the Global Fund are met. Those conditions, according to Global Fund communications director Jon Liden, largely bear on whether the money is meaning the health goals set by the donors. Among them, for example, is a commitment to cut in half the North Korean death rate from malaria by 2013, using the death rate in 2007 as a baseline (0.31 per 1,000 people, vs. 0.62.). Click here for Global Fund report on North Korea. Failure to meet the targets could result in reduced funding for the next three years, or a cutoff. The same apparently applies to the bulk of $101 million or so to be spent in North Korea by the World Health Organization (WHO). WHO activities include supporting UNICEF on the malaria and TB campaigns, but also building up North Korean health care, supplying equipment and drugs, and helping institute telemedicine. But WHO’s own “country cooperation strategy” for North Korea extends only to 2013, meaning all of its fundraising plans for the 2011-2015 have not yet been written. Just how challenging, perhaps, can be seen in the case of the struggling World Food Program (WFP), whose efforts are outlined in the U.N. Strategic Framework as trying to provide “fortified locally produced nutritious foods” to young children. In fact, WFP has been running a dwindling operation to provide emergency food to many more of North Korea’s desperately hungry population. But donors stampeded away from the WFP fundraising effort, especially after the Kim regime detonated a nuclear device last year, and questions were raised about whether the government was profiting from the food effort. Currently, WFP has dialed back the goal of its emergency food aid operation from $500 million in 2008-2009 to $91 million. Spirulina is an algae that has gained a reputation in alternative food circles as a diet supplement. In the U.S., health food websites offer a powdered form for anywhere from $24 to $33 per pound—hardly a cheap source of protein for starving people. It is also sold in the U.S. as tropical fish food. But whether North Korea needs a “pilot project” to produce spirulina is debatable. As far back as October, 2003, a North Korean news agency declared that the Kim government’s botanical institute had, “after years of researches [sic] completed the method of artificially cultivating spirulina at low cost.” The agency added, “It can be cultivated easily in greenhouses too.” Indeed, spirulina is currently listed as a marketable product on a North Korean export website. And on Aug. 6, a Chinese news agency announced that North Korean researchers had created a new spirulina vaccination “which prevents and treats domestic animals’ diseases and increases their weight.” Whether there was any independent verification of that claim was not mentioned in the news article. As for pistia statiotes, also known as water lettuce, according to the website of the Center for Aquatic and Invasive Plants at the University of Florida, the floating plant is a fast-growing weed, which can block waterways, deplete oxygen supplies in water, and threaten fish populations. It is described as an obnoxious invader in West Africa and Australia. While pistia can survive in temperate climates, it abhors cold and thrives mainly in tropical and semi-tropical environments—not exactly what North Korea is known for. One of the few places where it is cultivated for its nutritional value is apparently southern China, where it is sometimes used as a supplemental carp food. In a country full of starving or semi-starving people, of course, almost anything may be viewed as edible. But in the U.N.’s renewed desire to pour money into North Korea, the value of at least some of the projects it is pushing for approval may be hard to swallow. The Rajin-Sonbong region in North Korea (also known as Rason following a 2004 administrative reorganization by central authorities) is an underdeveloped backwater near the far northeastern tip of the Korean peninsula bordering Jilin province of China and Primorsky Krai of Russia. Although the area is far from the nerve center of the North Korean regime, Pyongyang, Rajin-Sonbong has strategic significance as the northern-most year-round ice free port in Northeast Asia and therefore is an attractive geostrategic transit point for the shipment of goods to landlocked Northeastern China and the Russian Far East. For this reason, recent reports of new Russian and Chinese investment deals following a rare personal visit by North Korea’s supreme leader, Kim Jong Il, to Rajin-Sonbong in December of last year merit closer scrutiny. Rajin-Sonbong has been the focal point of periodic efforts by Pyongyang to experiment with economic reforms since it named the area a free economic trade zone in late 1991. At that time, the Rajin port was an essential piece of a UN-sponsored regional development effort known as the Tumen River Area Development Project (TRADP)—which encompasses areas within China, Mongolia, Russia and South Korea—but the project never attracted sufficient international investment to take off. The spotlight returned to Rajin-Sonbong briefly in 1996 when North Korea sponsored an investor forum there in an attempt to stir up interest in a revamped set of investment laws for the region, but few investors came and North Korea’s famine later that year diverted attention away from the effort. The number of science and technology institutions in North Korea is estimated to hover around 300; about 200 institutions have been officially confirmed. Therefore, the North is unable to focus on building the hardware industry, which requires massive capital input and long-term investment, and is left with no choice, but to be keen on nurturing IT talent geared toward software development. As a result, the North has been producing excellent IT human resources in areas like artificial intelligence, needed for controlling man-made satellites and developing arms systems, and programming languages. The following IT institutions are in charge of fostering the North’s software industry: DPRK Academy of Sciences, Korea Computer Center (KCC), Pyongyang Information Center (PIC) and Silver Star, which is currently under the KCC. In particular, the creation of the PIC, modeled on the Osaka Information Center (OIC) at Osaka University of economics and law, was funded by Jochongnyeon, the pro-North Korean residents’ league in Japan, and was technologically supported by the UNDP. The Jochongnyeon-financed KCC has been responsible for program development and distribution; research on electronic data processing; and nurturing IT talent. Thanks to such efforts, nearly 200,000 IT talents were fostered and about 10,000 IT professionals are currently working in the field. Approximately 100 universities such as Kim Il-sung University, Pyongyang University of Computer Technology and Kim Chaek University of Technology (KUT) – and 120 colleges have produced 10,000 IT human resources every year. At the moment, the number of IT companies in the North is a mere 250, while the South has suffered from a surplus of IT talent. Therefore, inter-Korean IT cooperation is of great importance to the two Koreas. As aforementioned, the North has set its sights on promoting its software industry, which is less capital-intensive compared to the hardware industry. Above all, the North is getting closer to obtaining world-class technologies in areas such as voice, fingerprint recognition, cryptography, animation, computer-aided design (CAD) and virtual reality. However, the North’s lack of efficient software development processes and organized engineering systems remains a large obstacle to executing projects aimed at developing demand technology that the S. Korean industry wants. What is more, as the North lacks experiences in carrying out large-scale projects, doing documentation work in the process of development, and smoothing out technology transfer, much needs to be done to measure up to S. Korean companies’ expectations. Thus, the North needs to build a system for practical on-the-job IT training that produces IT talent capable of developing demand technology- which S. Korean companies need. 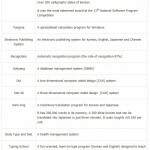 In addition, it is urgent for both Koreas to come up with an IT talent certification system that certifies both Koreas’ IT professionals. You are currently browsing the archives for the UNDP category.